Brian Viloria and Drian Francisco’s statement-making knockout victories over their respective Mexican opponents over the weekend were not the only reasons to celebrate for last Sunday as the power-punching Warlito “Wars Katsumata” Parrenas of Japan’s Katsumata Gym also won by knockout against Indonesia’s top 115-pounder and current WBO Asia Pacific Super Flyweight champion, Isack Junior at the Ginowan Convention Center in Okinawa, Japan. The knockout specialist who hails from Bacolod, Negros Occidental but is now living in the town of Koiwa in Tokyo, Japan reportedly put the Indonesian down courtesy of a right straight-left uppercut combination in the final round of their 8-round match-up. Thereafter, due to the hard punches, the latter failed to beat the count signaling the referee to wave the contest off at 0:26 seconds and declare him the winner by 8th-round knockout. Reportedly, the Indonesian had even stayed down for three minutes after the stoppage. With the win, he improves his record to 18 wins with 6 defeats (16 of the wins coming by way of knockout) while the Indonesian gets his third defeat in 25 bouts with 20 wins and 2 draws (8 by knockout). Furthermore, since the fight was done in the Super Flyweight division, he automatically becomes #3 by the JBC from his previous #1 rating in the Flyweight class. This writer had the privilege to have a chat with him online a couple of days after the fight and asked him a few things about his win and what’s next for him. According to him, he was very thankful that he came out with his hands raised because as per Katsumata Promotions, his promoter/manager, and his trainer, Venezuelan Santiago Caballero, he might get the chance to challenge the reigning WBO Super Flyweight champion, Omar Andres “El Huracan” Narvaez of Argentina (37-1-2, 20 KOs) by February or March next year. This development is being worked out for him following the good news that WBO is now recognized by the Boxing Commission of Japan (JBC). Upcoming 22-year old bantamweight prospect, Vergel “Ilocano Superman” Nebran (8-4-1, 6 KOs) of Bani, Pangasinan and the Elorde Boxing Gym lost via 10-round split decision to local prospect, Masamichi “Mexican Man” Nozaki (16-3-0, 6 KOs) despite knocking the latter down in the 4th round. At the end, the scores were 95-94 twice favoring the Japanese with the third judge giving it to him with the same score, 95-94. Another Elorde-trained boxer, Jaypee “The Hammer” Otilla of Parañaque City by way of Guinobatan, Albay (9-5-2, 6 KOs) was stopped at 1:15 of the 2nd round by Go Onaga (18-2-2, 13 KOs). Batangueño Super Featherweight boxer, Cirilo “Slugger” Espino (17-11-2, 11 KOs) lost in a close 8-round affair to Shogo Ishikawa (10-3-0, 3 KOs) with scores of 77-76 twice and 77-75. 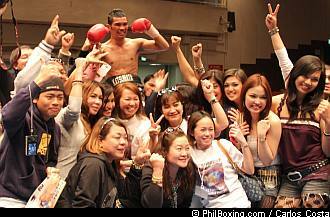 Photo: Wars Katsuman with fans during an earlier victory in Japan. Photo by Carlos Costa. Click here to view a list of other articles written by Myron Sta. Ana.